Incheon, Korea, 8 October, 2018 - A landmark scientific report released today assesses the prospects for limiting global warming to 1.5°C and shows the critical need for urgent action. Approved by 195 governments, the report underscores the small window of opportunity we have to move from the dangerous path the world is on. The Intergovernmental Panel on Climate Change (IPCC) Special Report on Global Warming of 1.5°C will guide governments’ decision-making on climate action moving forward. It makes clear that 1.5°C is safer than 2°C in terms of climate impacts, and that allowing global temperatures to rise by 2°C above pre-industrial levels will have more devastating consequences, including loss of natural habitats and species, dwindling ice-caps, rising sea levels - impacting on our health, livelihoods, human security and economic growth. “Above 2°C, we could see unstoppable climate change. This means we need a dramatic increase in the ambition of current climate policies and to speed up the transitions to low-carbon economies. Delaying action is too expensive to contemplate, as devastating climate impacts will come to undermine the global economy” Cornelius added. The IPCC report and its summary for policymakers were commissioned by governments following the UN meeting in Paris in 2015, when it was agreed to act to limit increases in global average temperature well below than 2°C and to try limit that increase to below 1.5°C. 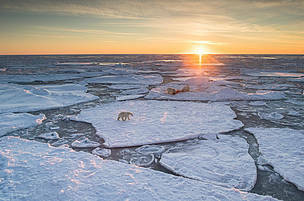 Polar bear (Ursus maritimus) on drifting ice, Svalbard, Norway, September.